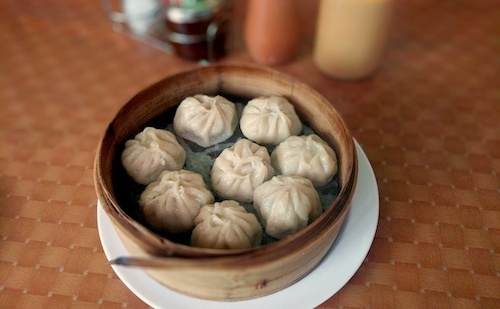 The namesake mountain that is drawn in the logo of this restaurant lives partly in the far east of Nepal and partly in the mountainous Indian state of Sikkim. When I asked the owner, she simply said it was in Nepal. An Indian answer may have been the reverse despite there being no border disputes in the area. 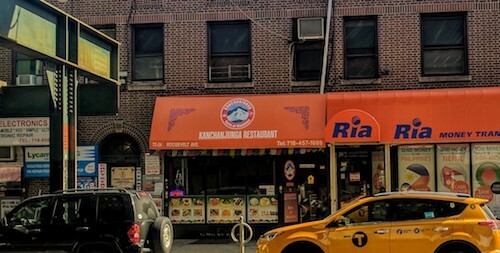 Either way, this lesser known brother of Everest is the third highest peak in the world and certainly worthy of its own restaurant in Jackson Heights. As the mountain straddles a border, so does the cuisine, with the menu reading as much Tibetan as it does Nepalese. The awning and menu say "Taste of Himalaya" and maybe this is more accurate, as the cuisines always overlap. Inside the restaurant, which has been home to a rotating list of other quick Himalayan joints, things seem more settled and welcoming. The dining room has been expanded from previous iterations and there is time to sit down with friends and take in a meal. Dark colors surround you on the walls, while nondescript cheap tables become background to the flags and fabrics of the Himalayas. Dining alone, a modest bowl of noodles was ordered at the outset. 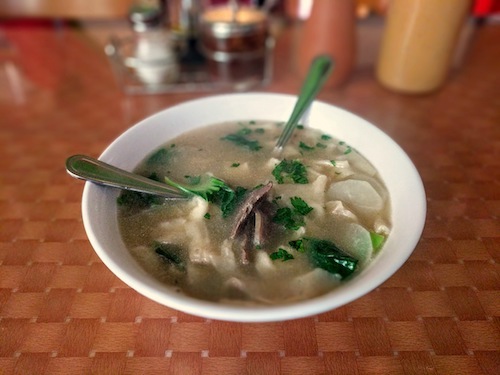 Thenthuk ($7, above) has always been a favorite, a mild soup that focuses on its biggest asset: the handmade noodles. This version uses wide wedges and came with beef cuts of similar size. Nepalese thukpa is somewhat similar, but bowls of Tibetan thenthuk can almost outnumber bowls of the native, spicier soup because of high numbers of Tibetan refugees in Nepal now. Since thenthuk does not have the chilis that thukpa automatically comes with, sauces are offered. The waitress asked if two were desired but turned around and fetched them before she got an answer, knowing the right answer was yes. The spiciest sauce is already on the table and should be handled with caution. Nepalese cuisine is decidedly fiery, and this stuff was causing the two Himalayans eating momos when I came in to cough uncontrollably. It really only carries the "flavor" of spiciness though, and nothing more. A small drop or two into the soup was enough to add quite a bit of heat. The two bottles brought from the fridge were the medium and mild versions, seen in the background of the above and below photos. The deliciousness of the sauces seems to go in reverse though, with the mildest tasting the best. The food here was hearty and good, not yet at the level of knock your socks off. The khaki meal continued with an order of chicken momos ($6, above), not so much because there was hunger as there was a desire to use the other sauces. After a few tries with different combinations, the best seemed to be slathering on the great mild orange sauce and then adding a squirt of the red medium to each bite. One stomach should have probably been too small for these two orders, but it pressed on regardless. As it reached its limit, a local man came in asking for a job, first in broken English, and then switching to a language everyone seemed to share. His information was left, and the newly installed television was tuned to a Himalayan music channel. Nepalese sadheko and chili dishes were further down the menu but would have to wait until another day.